Researchers performed global microRNA (miRNA) and gene expression profiling during adipocytic differentiation of human mesenchymal (skeletal or stromal) stem cells, and utilized bioinformatics as well as functional and biochemical assays, and identified several novel miRNAs differentially expressed during adipogenesis. 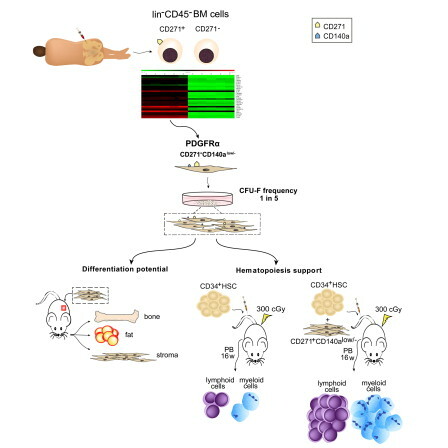 Scientists show that low/negative expression of CD140a (PDGFR-α) on lin−/CD45−/CD271+ bone marrow cells identified a cell population with very high mesenchymal stromal cells activity, measured as fibroblastic colony-forming unit frequency and typical in vitro and in vivo stroma formation and differentiation capacities. A coalition of Canadian stem cell advocates, researchers and charities has launched an aggressive Action Plan for Canada to lead the way in bringing up to ten breakthrough therapies to the clinic by 2025.